YouTube is the most widely used streaming music app globally but it is also the most controversial one, locked in a perpetual struggle with music rights holders, with neither side quite trusting the intent of the other. 2018 has already seen YouTube’s renewed focus on subscriptions as well as a European Parliament vote that could potentially remove YouTube’s safe harbour protection. Meanwhile, oblivious to these struggles, and despite the rise of audio streaming services, consumers are flocking to YouTube in ever greater numbers and, crucially, using it for music more than ever before. Back in 2016, at the height of the value gap / grab debate, MIDiA published its inaugural State of the YouTube Music Economy report. Now two years on we have just released the second edition of this landmark report. MIDiA clients have immediate access to the ‘State of the YouTube Music Economy’ report, which is also available for purchase on our report store. Here are some of the highlights from the report. 2016 proved to be a pivot point for YouTube. Rights holder relationships were at an all-time low with value gap / value grab lobbying reaching fever pitch. Meanwhile, vlogger hype was also peaking and longer-form gaming videos were beginning to get real traction. If there was ever a point at which YouTube could have walked away from music, this could have been it. The picture though, has transformed, with YouTube doubling down on music and in doing so, making itself an even more important partner for record labels. With young consumers abandoning radio in favour of streaming, YouTube is the biggest winner among Gen Z and Millennials; penetration for YouTube music viewing peaks at 73% among 16–19 year olds in Brazil. But its reach is even wider: YouTube is the main way that all consumers aged 16 to 44 discover music. YouTube has responded by improving its discovery and recommendation algorithms and gearing them more closely to music. The combined impact of demographic shifts and tech innovation is that YouTube is making hits bigger, faster. Billion-views music videos used to be an exceptional achievement, now they are becoming common place. By end July 2018, Vevo reported that there were already ten 1 billion views music videos for tracks released that year, accounting for 17.2 billion views between them. One billion view music videos that were released in 2010 took an average of 1,841 days to reach the milestone. Videos released five years later took an average of just 462 days, while those from 2017 took an average of just 121 days to get to one billion views. Over the course of eight years, YouTube has become more than ten times faster at creating billion-view hits. The impact on revenue is less even. Music videos are the single most popular video category on YouTube, accounting for 32% of views but a smaller 21% of revenue. Music is still the leading YouTube revenue driver with $3.0 billion in 2017 but many other genres, gaming especially, over index for revenue. (Many YouTube gamers have multiple video ads placed at chapter markers throughout their videos. Because music videos are shorter they get a smaller share of video ads.) Emerging market audiences are also pulling down ad revenues. The surge in Latin American markets has pushed artists like Louis Fonsi to the fore, but the less-developed nature of the digital ad markets there means less revenue per video. This trend is accentuated with the rise of emerging markets music channels like India’s T-Series becoming some of the most viewed YouTube channels globally. The net result is that effective per stream rates are going down on a global basis, but are going up in developed markets like the US, where the digital ad market is robust. This brings us to one of the existential challenges for YouTube. What does the music industry want YouTube to be? After years of nudging by labels, YouTube is now embarking on a serious premium strategy, but is that really what YouTube is best at? What YouTube does better than anyone else in the market is monetise free audiences at scale on a truly global basis (China excepted). 2018 is a turning point for YouTube. The accelerated success it and Vevo have enjoyed since 2016 over indexes compared to YouTube as a whole, which means that music is a more central component of the YouTube experience than it has ever been. However, driving impressive viewing metrics was never YouTube’s problem, convincing music rights holders that it is a good partner is. The value gap war of words may have died down a little but that is as much a reflection of the rise of audio streaming and a return to growth for record labels than anything else, as the European Parliament’s Article 13 vote highlighted. Safe harbour was never designed to be used the way YouTube does for music, and the fact it does so creates a commercial disincentive for other streaming services to play by music rights holders’ rules. The fact that YouTube can get a greater volume of rights and more cheaply than other services andbe the largest global streaming service unbalances the streaming market. Though against this must be set the fact that YouTube has been able to create a more rounded value proposition without operating within the same confines as other streaming services. The music industry needs the YouTube-Vevo combination, especially while Spotify scales its global free audience. The road ahead will be rocky, especially if Article 13 is eventually passed and also if rights holders continue to be disappointed by engagement growth out accelerating revenue growth due to the growing role of emerging markets. But it is in the interests of all parties to make the relationship work because neither side wants a YouTube shaped hole in the streaming marketplace, even if a Facebook / Vevo partnership was to try to fill some of it. Click here to see more details of the 29-page, 6,000 word, 11 chart reporton which this blog post is based. The report is based upon months of extensive research, industry conversations, MIDiA data and proprietary company data and represents the definitive assessment of the YouTube Music Economy. This week MIDiA held its latest quarterly research and networking event at Gibson Brands Showrooms in the heart of London’s West End. The event was heavily over-subscribed and was a great success (there are some photos at the bottom of this post). The event combined a presentation from Pete Downton, deputy CEO of our event sponsor 7digital, a keynote from myself and a panel of leading industry experts. Here are a few highlights of my presentation. Streaming music has got where it has today largely by being the future of retail and replacing the download model, which in turn replaced the CD model (though vestiges of both remain). That premium model will continue to be the beating heart of streaming revenues for the foreseeable future but will not be enough on its own. The next big opportunity for streaming is to become the future of radio, which incidentally is around double the size of the recorded music market. In doing so, it will be a classic case of disruptive insurgents stealing market share from long-standing incumbents. The opportunity for streaming is to build ad revenue around the younger audiences that are simply not engaging with traditional radio in the way that previous generations of young music fans once did. As the chart above shows, radio’s audience is aging and has an almost mirror opposite demographic profile to streaming. What is more, radio’s audience is declining by around one percentage point each quarter. It might not sound like much, but you normally do not measure change in terms of consistent quarterly trends. Instead there is normally quarterly fluctuation. So, this is nothing short of a major decline. However, what is interesting is that free streaming is not growing by the same rate radio is declining. Instead, what is happening is that radio and streaming audiences are co-existing, with many that have spent a long time doing both eventually shifting all of their listening to streaming. Added to this, older consumers tend to embrace change more slowly than younger audiences. So, radio’s older listener base effectively acts as a disruption buffer. What all this means is that radio is facing an existential threat like no other but it has some time to get its house in order, to identify how it can meld the best of the radio model with streaming experiences to start its fight back. And make no mistake, radio has so many unique assets that streaming does not (local content, talk, news, sports, weather, travel, brand personality etc.) and Apple’s underwhelming success with Beats 1 shows that hiring a bunch of radio people and launching a station does not guarantee success. Nonetheless, streaming services will get there. And Spotify’s recently launched Pandora-clone in Australia indicates just how serious the radio frontier is to streaming. For more (a lot more!) data and analysis on how radio and streaming are facing up against each other, check out our new report Radio – Streaming’s Next Frontier: How Streaming Will Disrupt Radio Like It Did Retail which can be purchased directly from our report store here and is also available immediately to MIDiA clients as part of our research subscription service. Ministry Of Sound’s Lohan Presencer stirred up a hornets’ nest with his impassioned critique of the freemium model at a recent MWC panel. This is one of those rare panel discussions that is worth watching all the way through but the fireworks really start about 16 minutes in. For a good synopsis of the panel see MusicBusiness Worldwide’s write up, for the full transcript see MusicAlly. I’m going to focus on one key element: free competing with free. Free music is a crucial part of the music market and always has been thanks to radio. The big difference is that radio is not on demand. Even the Pandora model, which quite simply IS the future of radio, is not on demand. The on demand part is crucial. Although labels have a conflicted view about radio there is near universal agreement that the model works because it is a promotional vehicle, it helps drive core revenues. But turn free into an on-demand model and the business foundations collapse. The discovery journey becomes the consumption destination. To paraphrase an old quote from a label exec ‘if you are playing what I want you to play that is promotion, if you are playing what you want to play that is business’. The argument most widely used by streaming services in favour of the freemium model is that it reduces piracy. There is some truth in this but the case is over stated. P2P was the piracy technology of the download era. Its relevance is decreasing rapidly for music in the streaming era. In fact mobile music piracy apps (free music downloaders, stream rippers etc.) are now more than twice as widespread as P2P. So the decline in P2P can only partially be attributed to streaming music services as it is in a trajectory of natural decline as a music piracy platform. So more needs to ensure the path from free to paid is a well travelled one. It might be that the accelerating shift to mobile consumption of streaming music may help recalibrate the equation. Mobile versions of free streaming tiers in principle may not be fully on demand but they often stretch definitions to the limit and some are simply too good to be free. Being able to create a playlist from a single album and then listening to it all in shuffle mode simply is on-demand in all but name. If we can get mobile versions of free tiers to look more like Pandora and less like Spotify premium, or YouTube for that matter, then we have a useful tool in the kitbag. And if users want more but aren’t ready to pay a full 9.99 yet, let them unlock playlists, or day passes for small in app payments. Lohan made the case for PAYG pricing to monetize the user that sits somewhere between free and 9.99 and it is an argument I have advocated for a long time now. Freemium absolutely can work as a model and it has achieved a huge amount already, but it needs recalibrating to ensure it delivers the next stage of market growth in a way that minimizes the risk to the rest of the business. None of this though can happen until YouTube is compelled to play by the same rules as everyone else. Otherwise all that we end up doing is hindering all music services except YouTube and Apple (which won’t have a free tier). Google and Apple are not exactly in need of an unfair market advantage. So a joined-up market level strategy is required, and right now. 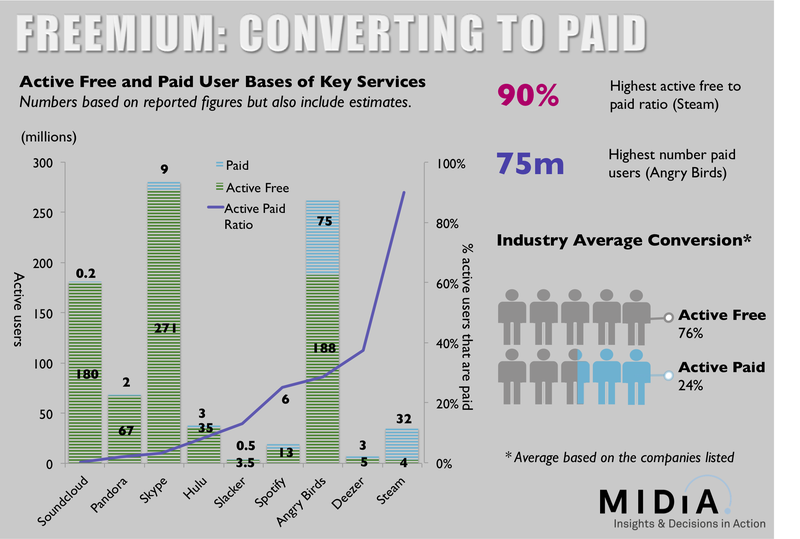 Today at MIDiA Consulting we have released a new report on the digital content sector entitled ‘Making Freemium Add Up’. The report combines an unprecedented appraisal of key freemium service metrics with market analysis and recommendations to create a definitive assessment of the freemium marketplace. In the report we analyse an intentionally diverse selection of consumer web services, looking at the distribution and scale of their user bases and the relationship of these with their business models. Services tracked range from music services like Slacker, through utility services like Skype to social services like Google+. It also includes long term data trend analysis of Spotify, Deezer and Pandora. The report is available for free to all subscribers to Music Industry Blog (to subscribe just add your email address in the Email Subscription box to the right of this post. If you are already a subscriber but have not yet received a copy of the report by email please email mark AT midiaconsulting DOT COM). Inactive users: inactive user rates range from 13% to 77%. Social services have the highest rates (77% for Instagram and 66% for Twitter). 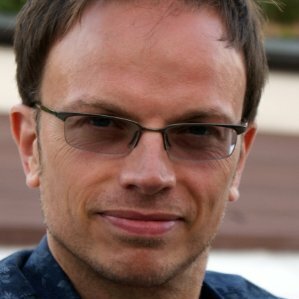 Inactive users are a key characteristic of all registration based services with free-to-consumer tiers, but the registered-to-active rate is below average for all freemium services However freemium inactive users are also often highly interested customers who simply need hooking up with the right pricing and product. In short, freemium inactive user bases are priceless qualified marketing lead databases. The challenge is to separate the wheat from the chaff, to differentiate between disinterested freeloaders and potentially valuable paying customers. Paid users: paid user rates range from less than 1% to 90%. But both ends of the scale are outliers. At the low end Soundcloud’s premium tiers are aimed at the smaller audience of creators that are just a small subset of its 180 million active users. While at the other end Valve’s gaming platform steam is more digital retail store than pure freemium destination. The risk for all freemium services is ensuring the free tier isn’t too good, unless free users are your key revenue source (cf Hulu and Pandora). Spotify and Deezer appear to have hit a conversion sweet spot, a solid balance between compelling free tiers and better enough paid tiers. The free-to-paid divide needs narrowing: the gap from free to paid is high, a significant leap of faith is required from the user. Whereas the gap from zero to $0.99 for Angry Birds free to paid is a modest step, from zero to $9.99 for Spotify or Deezer portable is a much more sizeable hurdle. Thus converting to paid for music subscription services is a more sizeable achievement than for low priced gaming apps. More needs to be done to bridge the divide. This can be achieved in through bundles and innovative pricing. Though this must be set against the risk of cannibalizing full price tiers.